Just a quick note announcing the May 2009 Music Education Blog Carnival. 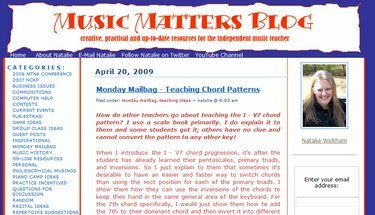 Natalie Wickham, over at the Music Matters Blog, will be hosting this month. She is an active music educator, blogger, and writer. In addition to her Music Matter’s Blog, she also hosts and operates the pajamaschool blog where she writes about all things related to home-schooling. We are looking for hosts to continue the tradition of the Music Education Blog Carnival, if you’ve already successfully submitted an article and have been posted in a music education carnival, why not consider being a host? Please let me know if you are interested via the contact form or in the comment section below. Find out about our music carnival here: http://mustech.net/muscarn and/or send your submission for the carnival direclty by visiting this link.